1 oz lot of 100. 1 oz lot of 500. 1994-P Proof Silver American Eagle PR-70 PCGS (Registry Set) - SKU #61335. 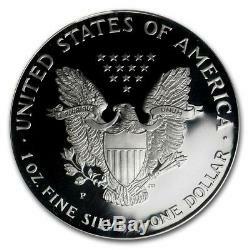 The mirrorlike finish on this Proof Silver American Eagle adds to the beauty of the beloved design. Key Date with a mintage of only 372,168 coins. PCGS encapsulation protects the perfect 70 condition of the coin. Mirrorlike Proof finish adds further beauty with an impressive shine. 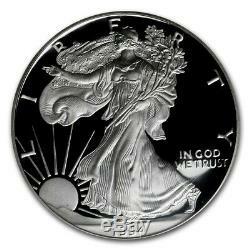 Weinmans design showing Lady Liberty draped in an American flag, walking gracefully as the sun rises over a ridge. Reverse: A heraldic eagle is shown below 13 small stars, representing the original colonies. Sovereign coin backed by the U. One of the most popular designs ever to grace American coinage, the Silver Eagle combines beauty with collectible value. 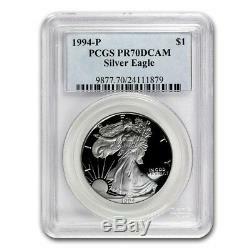 Add this certified 1994 Proof Silver Eagle to your cart today! Each package is fully insured. If an amicable resolution cannot be reached, you agree that any and all disagreements and disputes between us shall be resolved in accordance with the following paragraphs: (a) Forum Selection and Governing Law. All such disputes shall be resolved exclusively in such federal and state courts, as appropriate, in that jurisdiction. You hereby consent to personal jurisdiction and venue in those federal and state courts for the purpose of resolving any disagreements or disputes between us and waive all objections to the jurisdiction of such federal and state courts. Any action arising out of or relating to these T&C shall be governed by, and interpreted in accordance with, the laws of the State of Oklahoma, without regard to conflict of laws principles. (b) Waiver of Jury Trial; Arbitration. If APMEX cannot perform any obligation hereunder as a result of any event that is beyond its control, APMEX's delay or failure to perform such obligation shall be excused and APMEX shall not be liable for any damages as a result of, or in connection with, such delay or such failure. You shall execute and deliver such other documents and take such other actions as may be reasonably requested by APMEX to carry out your obligations under these T&C. Except as otherwise provided herein, all notices and other communications to APMEX shall be directed to APMEX, c/o Chief Financial Officer, 226 Dean A. McGee Avenue Oklahoma City, OK 73102, and all other notices and other communications to you shall be directed, at the option of APMEX, to the address that you provided to APMEX at the time of your registration. If you become aware that you may be required to make any disclosure of such information, including, without limitation, as a result of the receipt of a subpoena or other compulsory process, you shall promptly notify, in writing, APMEX and you shall cooperate, in good faith, with APMEX in obtaining a protective order or other appropriate relief, if any, with respect to such disclosure. The item "1994-P Proof Silver American Eagle PR-70 PCGS (Registry Set) SKU #61335" is in sale since Friday, April 8, 2016. This item is in the category "Coins & Paper Money\Bullion\Gold\Other Gold Bullion". The seller is "apmex" and is located in United States. This item can be shipped worldwide.